Alzheimer's disease is an incurable disease that strikes mostly elderly people, gradually destroying nerve cells in their brains and little by little erasing their ability to remember, think, and take care of themselves. Joe's grandmother seems to do the strangest things. She repeats stories she told him in almost the exact words she used during his last visit. She forgets the words for common objects, like the television or her cane. She puts her purse in the oven and sometimes comes to dinner with her dress inside out. At times, his grandmother does not recognize him or his mom. That scares Joe the most. At first, the family simply thought she was getting old. Joe's grandmother is in her eighties, and his mother told him that sometimes at her age people have trouble remembering things. But over the past year, Joe's grandmother's forgetfulness and odd behavior have gotten worse. She gets angry and is suspicious of everyone. The family now knows her problem involves more than just a touch of forgetfulness, which happens to everyone once in a while. Joe's grandmother has a disease called Alzheimer's (ALTS-hy-merz). A Disease That Is Like a "Long Goodbye"
Just as Joe's mother said, as people get older sometimes they have trouble remembering. Alzheimer's disease often seems at first like normal, everyday forgetfulness. But it progresses until the memory problems cause the person to forget, for example, how to tie his shoes or what year it is. As time passes, the person with Alzheimer's fails to recognize loved ones or even remember who he is. Eventually, the disease makes it impossible for a person to live without help. The disease is sometimes called "the Long Goodbye," because family members feel as if they are saying goodbye to the person they once knew so well as the disease affects their loved one's mental abilities more year after year. Alzheimer's disease is a dementia * that affects more than 4 million Americans. There are more than 70 types of dementia that can be caused by strokes, Parkinson's disease, alcoholism, and other diseases and conditions. Alzheimer's disease is the most common cause of dementia. Alzheimer's is very rare in people younger than 65, gets more common with age and is especially common in people over the age of 85. The brain of a person with Alzheimer's disease contains abnormal plaques, or dense clumps, of a protein called amyloid and abnormal tangles of another protein called tau. The plaques form between neurons, or brain cells. The tangles form within the cells. These deposits prevent the brain from working properly. In addition, the production of a brain chemical called acetylcholine decreases. This chemical is a neurotransmitter, which means that it helps signals move from one nerve cell to another in the brain. So the drop in this chemical hinders communication between brain cells. The brain in harmed in another way, too. The cells no longer get all the energy they need to work properly because the cell's glucose metabolism (the chemical process that provides the cells with energy) is reduced. Eventually, large numbers of brain cells die, and connections between the cells are broken. Although the German doctor Alois Alzheimer first described the disease in 1906, it was not until the 1980s that scientific and public awareness about this disease became widespread. 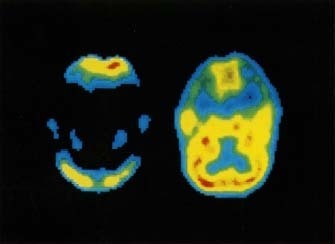 PET scans (positron emission tomography) comparing the brain of a person with Alzheimer's disease (left) with a healthy brain (right). Alzheimer's disease does not result from any single factor, but rather from a number of factors that combine in different ways for different people. Researchers have identified at least three genes * that appear to cause some of the cases of the rare familial form of the disease. Almost everyone who has one of those genes, called APP, presenilin-1, and presenilin-2, gets the disease. But taken together, these three genes account for only a small share of all Alzheimer's cases. In addition, scientists have identified at least one gene that seems to play a role in many cases of the more common sporadic Alzheimer's disease. This gene is called APOE, and it comes in three different forms (APOE2, APOE3, and APOE4). The APOE4 version increases the risk of Alzheimer's, especially in people of European or Japanese descent. But unlike the familial Alzheimer's genes, APOE4 does not always cause Alzheimer's. Many people who have the gene do not have the disease, and many people who have the disease do not have the gene. This kind of gene is called a risk or susceptibility gene because it increases risk but does not cause a disease by itself. Scientists think that other factors must interact with APOE4 for the disease to occur and that other genes probably are involved in Alzheimer's as well. Researchers have suggested that Alzheimer's disease results when the natural processes of aging do not occur normally. The fibers and plaques in the brain of a patient with Alzheimer's disease also are found in the brains of people who do not show signs of the disease. It appears that as a person ages, something causes brain cells to die and clumps of fibers and plaques to develop. But in persons with Alzheimer's disease, this natural process moves more quickly, causing a larger buildup of damaging material in the brain. Minor, undetected strokes * cut off blood supply to parts of the brain. This causes cells to die, and as a result fibers and tangles of dead nerve cells and abnormal proteins develop. Infection from a virus might cause damaging processes in the brain. An injury to the head, perhaps from a bad fall or car accident, might trigger damaging reactions over time in people with certain genes linked to Alzheimer's disease. Lifestyle factors, such as smoking and poor nutrition, might accelerate the aging process. What researchers do know is that Alzheimer's disease is not a natural part of aging. Alzheimer's is a disease that we are slowly learning about as research continues. "Who Are You? Get Out of My House!" The first sign of Alzheimer's disease usually is memory loss. Grandmother cannot remember where she put her car keys. Grandfather forgets to let out the cat. It happens to everyone, they say. But slowly, a pattern develops. The person forgets the way to the local grocery store, where he has gone for years. Simple tasks, such as making change or using a common device like a phone, start to seem as complex as designing a spaceship. People with Alzheimer's disease feel anxious in this early stage. But they often become adept at overcoming the problems. If Grandfather forgets names, he might start calling everyone "Sport" or "Pal." If Grandmother forgets how to get to church or a friend's house, she might start asking family or neighbors to take her. But Alzheimer's disease is like a fog that slowly covers the landscape. Skills continue to erode. At first, perhaps a boiling pot of water was forgotten on the stove, but now the person with Alzheimer's might insist he never put that pot there in the first place, or even forgets that boiling water can burn. The disease begins to affect the person's ability to perform activities of daily living. She forgets how to use the shower or cook or drive. She may get lost in the neighborhood or drive miles in the wrong direction without realizing it. She often starts to show strange behavior or poor judgment, such as putting jewelry in the freezer or wearing a nightgown to the store. Sometimes things seem clear. At other times, they are confusing or impossible to understand. As the disease moves through this middle stage, family members become sure something is wrong, especially as their loved one fails to recognize them. Even if clear moments return, the family knows the problem is not just "old age." * stroke A stroke occurs when a blood vessel bringing oxygen and nutrients to the brain bursts or becomes clogged by a blood clot or other particle. As a result nerve cells in the affected area and the specific body parts they control do not properly function. Alzheimer's disease was named after Alois Alzheimer (1864-1915), a German physician who studied the cells and tissues of the central nervous system. Several different doctors had been studying and writing about this disease, but it did not get its now familiar name until 1911. That was the year when the German psychiatrist Emil Kraepelin (1856-1926) referred to it as "Alzheimer's disease" in a published article. By the final stage, things become even more difficult. Memory is so poor that the person might not recognize her own children and grandchildren during any visit. She might have clear memories of her childhood and imagine she is a schoolgirl, but does not remember what grade her grandchild is in. Many Alzheimer's patients start wandering, as if looking for something familiar. Others become fearful or angry and yell at loved ones. They often accuse the people who take care of them of wanting to harm them or steal their things. Most people with Alzheimer's disease are cared for at home, which is a challenging task for the family that is compared to a "36-hour day" because the job is difficult both physically and emotionally. In the end, almost everyone with Alzheimer's disease needs the kind of advanced care a family cannot provide easily at home. They lose control of bodily functions, such as the ability to go to the toilet themselves. They cannot walk or feed themselves and eventually lose almost all ability to speak, think, and act. Many must move into a nursing home with a full-time staff of aides, doctors, and nurses. Death usually comes from complications related to age, such as pneumonia, heart disease, or malnutrition, rather than Alzheimer's disease itself. Alzheimer's is a difficult disease to distinguish from other kinds of mental problems. Doctors usually begin by taking a medical history and doing a physical examination to make sure some other condition or other type of dementia is not the real cause of the memory and behavior problems. Many diseases and conditions can cause symptoms similar to those of Alzheimer's. Some, such as vitamin deficiencies, can be corrected easily; others can be treated with prescription drugs. Doctors also will administer a variety of verbal and written tests to assess how well the person's brain is functioning. They will interview the person and his family about recent events, looking for examples of the symptoms we mentioned earlier. If a person is younger than 60 years old, a genetic test might be ordered, because most cases of Alzheimer's disease in people who are between 40 and 59 years old are linked to the presence of certain genes that can be identified. Sometimes, doctors look for signs of a stroke or abnormal areas in the brain using X-rays or other hightechnology equipment that allows a look inside the body, such as a magnetic resonance imaging (MRI) machine. With all this sophisticated equipment and testing, accuracy of diagnosis is 85 to 90 percent. Once other possible causes of the symptoms have been ruled out, doctors begin to suspect strongly that a person has Alzheimer's disease. If the symptoms continue to worsen with time and no other explanation can be found, doctors say someone has Alzheimer's disease. But at this point, the diagnosis is not confirmed completely without a direct examination of brain tissue at autopsy after the person has died. Doctors look for the presence of plaques and fibers, which look like small, tangled spiral staircases. Alzheimer's disease can occur in people in their thirties, but it is most common in people over age 65. Almost 90 percent of cases occur in the elderly, and as many as 50 percent of people over age 85 might have the disease. Four million people in America have Alzheimer's. One of the most famous is former U.S. President Ronald Reagan. Studies suggest that as many as 19 million adults and children have a relative with the disease. As many as 37 million Americans know someone with it. As more Americans live to advanced ages in the 21st century, the number of people with Alzheimer's could reach 14 million. The disease costs American businesses more than $33 billion a year. Most of that, $26 billion, comes from employees who must miss work to care for relatives with Alzheimer's disease. The rest is money spent on health insurance, research, and taxes for government programs like Medicare. Patients with Alzheimer's disease can live as long as 20 years with the disease. The average person lives eight years after diagnosis of the condition. "Is Alzheimer's Disease a Slow Death Sentence?" Research into how Alzheimer's disease affects the brain has led to the development of two drugs that help relieve some of the symptoms in some people. The drugs do not cure the disease or slow its progression. These drugs may work by improving how nerve cells communicate in the brain, which can lessen some of the symptoms in people with mild to moderate forms of Alzheimer's. The relief, however, is not permanent, and the drugs do not work for everyone. Many drugs that offer hope of slowing the disease's relentless march and perhaps reversing some of its effects are under development and could become available in coming years. Currently, doctors may prescribe drugs that can help a patient with Alzheimer's disease with problems associated with the disease, such as depression, sleeplessness, and agitation. At present, there is no known way to prevent the disease. There are, however, some promising studies. One such study suggests antioxidants like vitamin E might prevent damage to cells, including those in the brain. Antioxidants (an-tee-OX-i-dents) are substances that appear to block the effects of free radicals, which are harmful substances that are created when food is turned into energy in the body's cells. Researchers are investigating whether these free radicals play a role in many diseases, from glaucoma to some cancers, and whether increased intake of antioxidants like vitamin E can prevent or slow these diseases. But they are far from proving this theory. Scientists have seen apparent benefits in people who take antiinflammatory drugs like ibuprofen (i-bu-PRO-fen), a pain reliever. Researchers studied sets of twins in which one twin got Alzheimer's and the other didn't. They discovered that often the twin who did not get Alzheimer's disease was taking anti-inflammatory drugs for arthritis. Like antioxidants, the drug might work by blocking cell damage from free radicals. Another promising area of research involves the benefits of estrogen, a female reproductive hormone. Estrogen levels drop in women in their late forties and fifties as they enter menopause * . Often they take estrogen as a prescription drug, because it controls undesirable side effects of menopause, including the weakening of their bones. Some studies suggest that women who take estrogen have sharper mental skills and face less risk of Alzheimer's disease than those who do not. A project to test estrogen's benefits for Alzheimer's disease is under way. But doctors warn that estrogen might have harmful side effects for some women, such as some with a family history of breast cancer. Some people promote the benefits of an over-the-counter nutritional herbal supplement called ginkgo biloba. They say it helps improve memory. One American study in 1997 did show some improvement in patients with Alzheimer's disease who took the extract. But more research is needed to confirm the study. Doctors urge caution because ginkgo biloba can cause problems for people with blood disorders or for those who are on aspirin therapy. Also, like other over-the-counter nutritional supplements, ginkgo biloba does Inot have to meet rigid scientific and government standards and so may vary in strength and levels of impurities. Alzheimer's disease tears apart a person's life as it slowly marches along its course. For the loved ones, like grandchildren, it can be difficult to watch as the disease progresses. It is important to understand that not all cases of forgetfulness are signs that a beloved grandmother or parent is developing Alzheimer's disease. In most cases, the disease does not appear to run in families, so grandchild will not get Alzheimer's just because a grandparent has it. And even if the disease is confirmed, many people live for years when they find ways, with the help of family and doctors, to stay involved with life. Many older people worry when they seem to forget things, like where they placed a favorite book orthe name of the neighbor's grandson. But this does not mean they have Alzheimer's. Researchers know that as a person ages, they often start to have problems with their memory and retaining new information. "There is probably a direct relationship between the number of reminder notes that you write (or the frequency with which you forget things) and your age," writes Leonard Hayflick, Ph.D., in How and Why We Age (Ballantine Books, 1996). "It is firmly established that older people do not perform as well on memory tests as do younger people." But if it is not Alzheimer's disease, what causes these changes in memory? Part of it involves a slowing of reaction time as we age. That means an elderly person might need more time to respond when they are trying to remember something. Sometimes, poor eyesight or hearing might make it appear an older person is forgetful. Other conditions, such as fatigue, depression, and even anxiety over looking foolish, can cause an elderly person to forget information. Alzheimer's Association, 919 North Michigan Avenue, Suite 1100, Chicago, IL 60611-1676, (800) 272-3900. The leading support organization for people with Alzheimer's and their families, with chapters in many communities. The association maintains an extensive library, including many books written for younger readers and available for borrowing. Its website offers detailed information. Alzheimer's Disease Education and Referral Center, P.O. Box 8250, Silver Spring, MD 20907-8250, (800) 438-4380. Known as the AD EAR Center, it is a resource center on Alzheimer's sponsored by the National Institute on Aging (NIA). It is a place to get the NIA's annual progress report on the disease, as well as other information. The Center's website provides a wealth of informative material. Mace, Nancy, Peter Rabins, and Paul R. McHugh. The 36-Hour Day: A Family Guide to Caring for People with Alzheimer Disease, Related Dementing Illnesses, and Memory Loss in Later Life, Third Edition. Baltimore: Johns Hopkins University Press, 1999. A classic guide for people caring for loved ones with Alzheimer's disease. The title refers to how long the day seems to busy caregivers. The National Institutes of Health posts information about Alzheimer's disease on its website.